Spring has finally moved in and is rapidly approaching summer here in Boston and I am simultaneously thankful and irritated. The thankfulness comes of knowledge of fresh and local produce that will soon be gracing my table and kitchen and the irriation comes of horrible spring hayfever. I know we all have it on heavy pollen days – the runny nose and itchy eyes come with the territory, but just once I would like to smell the lilacs and not sneeze for the rest of my walk home. But the produce – that I can get behind. With the city’s seasonal farmer’s markets starting up I’m getting impatient for food that tastes fresh again. On a recent trip to the Dewey Square Farmer’s Market I was thrilled to see Kimball Farm with bunches of asparagus for $5 each. They were good and I was excited to be seeing produce that is creeping closer to home as the ground warms and green things start to explore the world. With the fresh asparagus comes the hope of greater things coming soon – tomatoes that taste like tomatoes (gasp), peppers that I want to eat, and fresh herbs that I’ll add to some greens (which you can get at your market now thanks to cold frames and awesome farmers), add a squirt of lemon juice and call it dinner. But we’re not quite there yet. For now I have some root vegetables left over from the winter and this farm fresh asparagus – the first sign of summer actually coming to stay. I love asparagus, especially the tender green shoots that are no bigger than a pencil and burst with a sweet and green flavor; it’s filling and delicious. 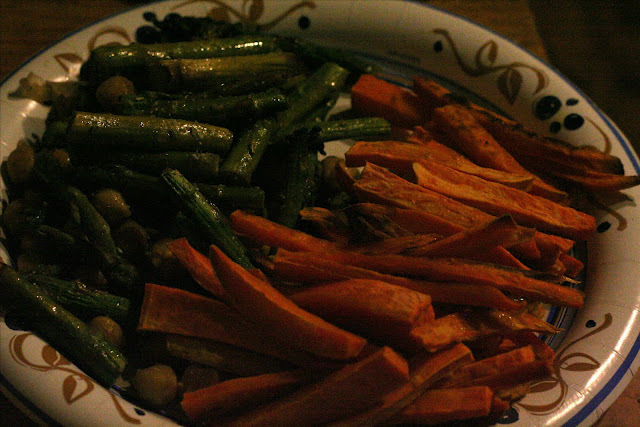 I basically turn BF and I into vegetarians while asparagus is in season, buying it in quantities that make most people look at me strangely, and gently roasting it with chickpeas at least twice a week. I’m obsessed. And it’s soooo worth it. We aren’t vegtarian eaters usually – add a sausage or some chicken to our meals and we’re happy campers but this roasted asparagus dish is fantastic and when I made it the other night as a quick meal, BF asked me to make it again. I was so surprised you could have knocked me down with a feather, a quick and easy meal that’s cheap and delicious – oh yeah I’ll make it again (and again and again). The best part of this “meal” if you want to call it that, is that it’s virtually effortless – remove the bottoms of the asparagus, cut it into finger lengths, and toss it with some oil and spices. It’s a meal! 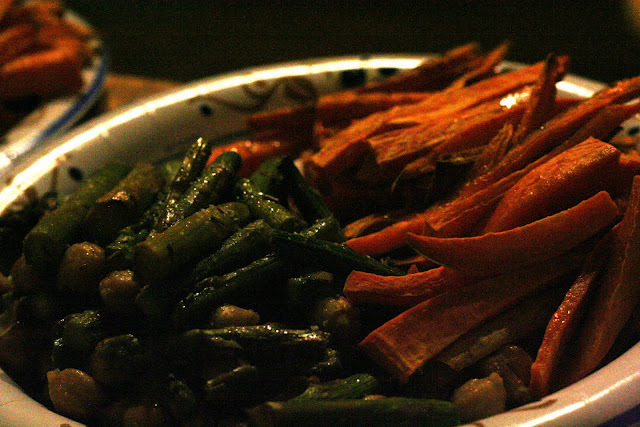 Veggies! Protein! I suppose you could do it as a side, but it’s delicious on it’s own. I like it with sweet potato fries – which is a great way to use up the tail-end of those wintered-over potatoes that are hiding out anyway. Preheat the oven to 350 degrees farneheit. Add the asparagus and chickpeas to a 2 inch deep baking dish (I use a 13×9 glass pan) and drizzle the olive oil and balsamic over them. 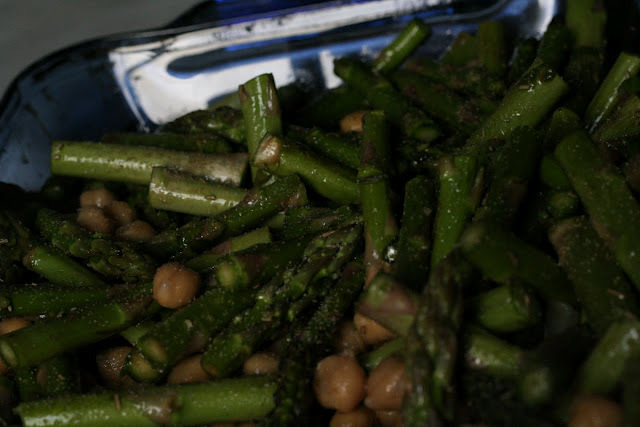 Gently toss the asparagus/chickpeas with the oil and balsamic (this can be done in a bowl if you are not confident of your abilities to keep them in the pan). Add the salt and spices and give everything a final toss to evenly distribute the spices. 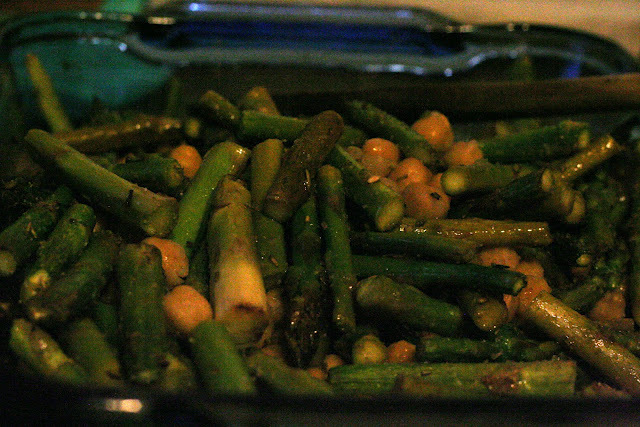 Stick the pan in the oven for 20-25 minutes until the asparagus is tender and a little wilty. The asparagus will be fantasic and the chickpeas crisp up so much that you will chase them around your plate until they’re gone. I promise. This makes a great entree meal for two (with sweet potato fries, of course) or as a side for more. Deee-licious. So, about a month ago I got together with Megan and Amanda for an awesome and truly delicious Bake Date. We ate croissants and pop tarts, drank hot cocoa, and played a ton of banana grams (if you haven’t played that game you really should, it’s super fun and lots of indignation will happen). I also made some dips and homemade pita chips to make our bake date not kill us with sugar. At least that was the plan. I made two dips actually but I’m only going to write about one of them – ever probably, number two was not good. A while ago (after blogger brunch at Dorado Tacos actually) I ended up hitching a ride to Russos with Renee and we talked about whipped feta dips. Batting ideas back and forth over the ways feta could be used to make a dip and which feta would be best for it. She ended up making one with beets (which is a fabulous shade of pink and I totally need to make). And I made one with roasted red peppers (unbeknownst to her, admittedly, but it was this conversation that inspired me to actually try it). I chose roasted red peppers because in the handful of times I have gone to Sofra I have gotten this mezza as an appetizer and it makes me giddy, fresh pita chips and some of this dip and I’m set. Give me a book and I’ll read, and munch, for a good long while (well until the dip is gone anyway). 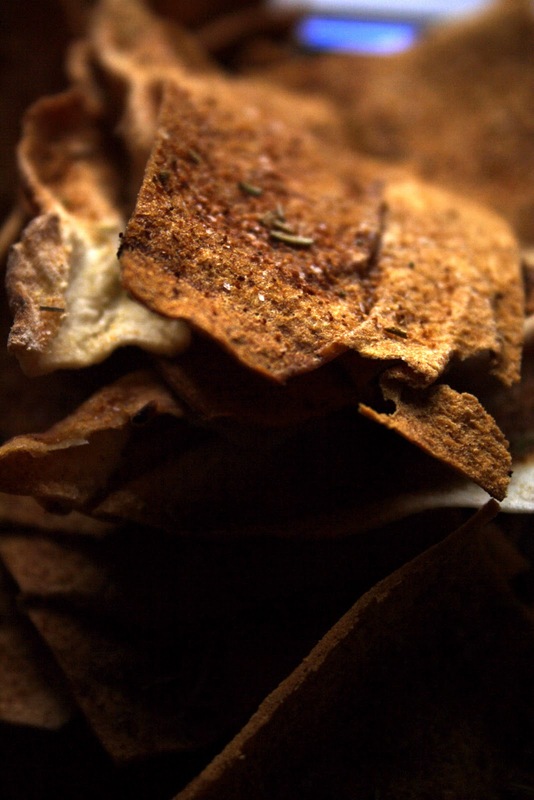 The pita chips were merely an experiment to see if I could do it. There was no recipe to go by, just an idea that if I was spending $2.50 per bag on pita chips wouldn’t it be better to make them myself? I was right. It was worth it. They were delicious, and I was lucky I was able to save any pita chips and feta dip once BF tried them. 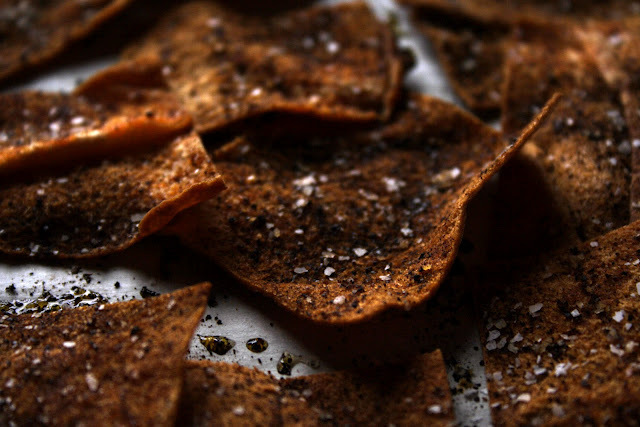 Both the chips and dip were so remarkably simple I’m surprised I hadn’t tried them sooner. Now I strongly recommend you try them too. 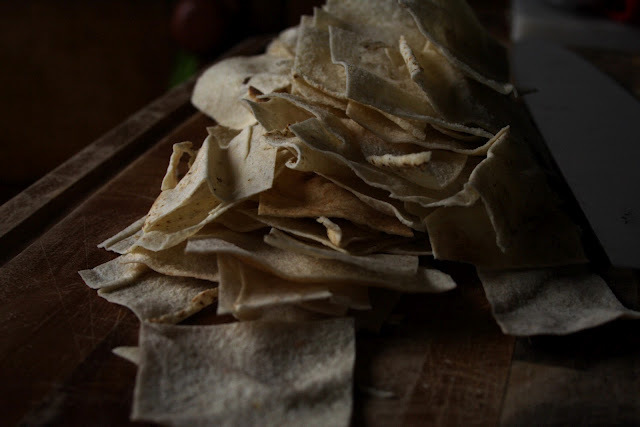 Note: This recipe just deals with one “bag” of pitas but you can easily make more. It’s also a very fast process so don’t go wandering too far while the chips are baking. Note: I made this after eating it at Sofra. It’s delicious. 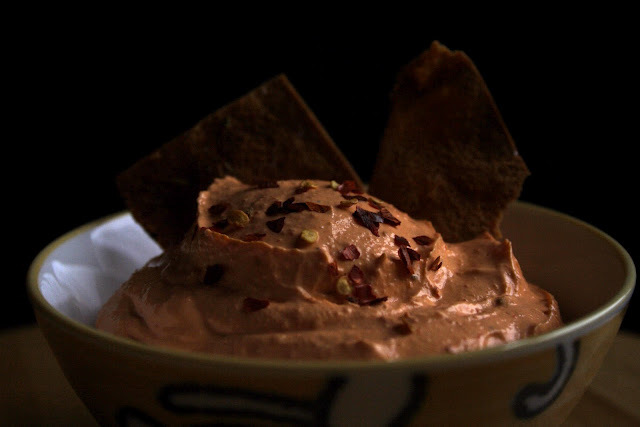 If you don’t have a food processor get it, if only to make this dip, though I suppose it could be made in a blender. If you were watching it. Also, a note about feta – get it fresh, it tastes worlds better and is very easy to get in the Boston area – ANY middle eastern market will have it, I know of 4 places in Watertown that do. Another feta note, I recommend using Bulgarian Sheep’s milk feta for this (it’s not as salty as the cow’s milk, maybe the brine is different? Anyone know?) but if you can’t find that – rinse your cow’s milk feta to lose some of the saltiness, the second time I made this dip I used mostly cow’s milk and didn’t rinse which left me with overly salty dip which needed to be modified, a lot. 1/3-1/2 pound Bulgarian feta – this is more creamy than cows milk/domestic feta if you can get it. It is the superior choice. Break the feta up into large-ish chunks (the size of a clove of garlic is good) and add them to the bowl of a food processor, incidentally I cannot recommend enough that you get a food processor – they are so wonderful from grated potatoes for latkes to this decadent dip they get the job down extraordinarily well. Chop the roasted red pepper into 4-6 pieces enough so that the processor doesn’t hate you. Add the pepper, roasted tomato, and garlic to the feta. Turn the food processor on for 10-15 seconds, then check the consistency of the dip – is it stilla little chunky – whip it some more, is it still a little thick – add a bit of oil. 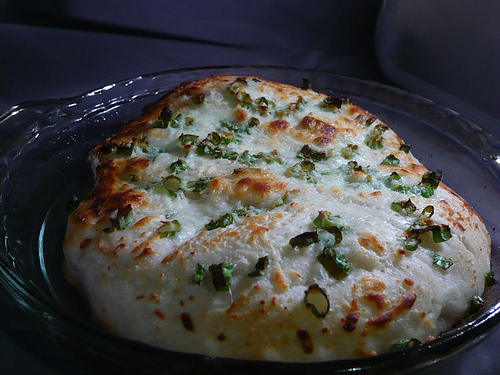 Add the oil in a slow drizzle while the food processor is on, much like making pesto, until the dip has reached the consistency you want – I like my dip a little stiff but soft enough to pick up with a pita chip, this is about 1 tbs – more if the feta is dry. After mixing in the olive oil taste the dip – does it need salt, most likely no but if your feta is tangy it may, is it salty? If you find your dip salty I was able to neutralize that fairly easily with some plain yogurt about 1/4 cup. The important thing for this dip is that you keep trying it until the flavor is what you like, since you will be eating it and having to throw this sort of thing away is sad. It will be orange, that’s ok it’s still delicious. Eat it while, of course, playing Bananagrams with friends. I am a guest poster over on Alicia’s super delicious blog. 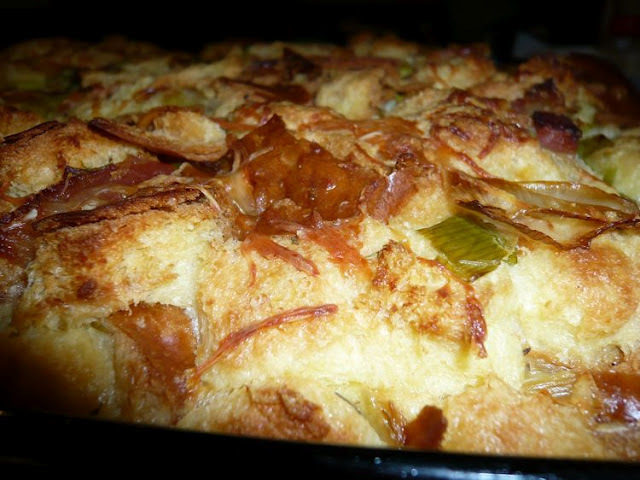 I made fantastic Leek and Bacon Bread pudding for her! Go Check it out! There’s something satisfying about having a quick and delicious go-to bread in the house. This is mine. I like fresh warm bread, as a snack or an accompaniment to a meal. Warm and fresh bread is delicious. I don’t make my own pizza dough for this as it’s one of those things I typically make on a weeknight when I’m feeling lazy and a premade ball of pizza dough is one of those things I try to have on hand at all times. It’s easy and totally delicious; sort of instant gratification food. Everytime I make this it prompts BF to poke his head in the kitchen and sniff hopefully asking, “Focaccia?” I almost always answer in the affirmative. I am totally guilty of eating too much bread. I like it with pasta, soup, stew, quiche; in short everything. I think it’s a quick way to bulk up a meal and still keep it delicious. Admittedly, I’ve been known to make this particular concoction on a weekend afternoon as a snack for watching a movie or just because I want something savory and what’s around doesn’t work for me. This is a morph of the breadsticks my mom used to make when we were kids, which were always super crispy and delicious in a denuded pizza kind of way, but this is an entirely different creature. This focaccia grew up from breadsticks (which I almost always overcooked) and my Chicago Style Deep Dish Pizza with its crispy and delicious bottom. This is decadent but so-so-so good. Swoon-worthy. I keep thinking that someday I will make something on here that takes less than a tablespoon of butter/oil, but what fun would that be? Eat this fresh from the oven and share it. It’s simple and fast. Note: This is not a classic focaccia bread, with the cornmeal and flatness, it’s pretty pouffy. But that’s ok. Also it cuts well with kitchen shears if you have them. Preheat the oven to a searing hot 450 degrees farenheit. Pour the olive oil into a deep dish pie plate or round cake pan. Add the dough ball to this oil coated pan and cover all the dough with oil. Poke the dough all over so it looks dimpled consistently. 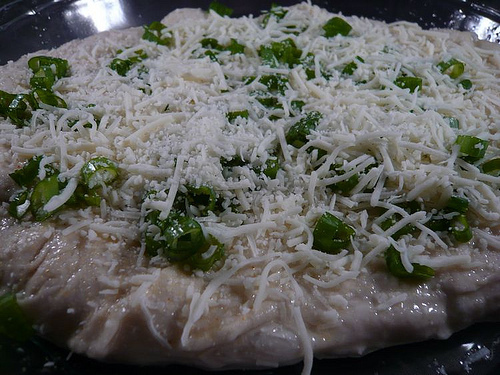 Sprinkle salt, garlic powder, and scallion/basil/tomato on the dough. Cover with the shredded cheese and toss the whole thing in the oven for 15-20 mins until it’s brown and the cheese is melted. If you are responsible you will wash the dishes now; if you are me you will probably be more likely to go play a round of Mario Kart or beat level 1-1 in Super Mario Bros 3. I have an inanimate love, its’ name is Nintendo Wii. I can admit that with pride even. Is anyone else as stoked for PAX East as I am?